Dress in layers. This is the most important element of winter dressing. Layers help trap warmth, and they also allow you to take off the top layer if you get too hot. Start with a layer of a wicking fabric such as thin wool, silk or a manmade fabric next to the skin. Silk long underwear is an excellent choice; wear it both on the top and on the bottom of your body. Next, add a layer of fleece or wool. And finish off with a layer that is windproof and waterproof. Don’t wear tight layers. First, it will be hard to move around and enjoy your outdoor activities. In addition, loose layers do a better job of insulating. Don’t choose cotton. Cotton is excellent in hot weather, because it quickly soaks up sweat or other moisture. But in the winter, that moisture does not dry up. Instead, it just sits on your skin, which makes you even colder. Cover your head. As a general rule, the uglier the hat is, the more effective it is. Cute little berets and beanies do very little to protect against serious cold. You want a hat that covers your ears. For example, an excellent cold-weather option is a bombardier hat that has earflaps you can fold down and secure under your chin. Don’t forget your face. A scarf or a gaiter that you can pull up to cover your nose, mouth and chin can protect against icy winds. In addition, breathing through some kind of covering can warm the air before it hits your lungs. Choose the correct hand covering. Whether you wear mittens or gloves depends partly on what you are planning to do. If you need your fingers free, gloves are the obvious choice. However, mittens generally keep your hands warmer because your fingers help to warm each other. 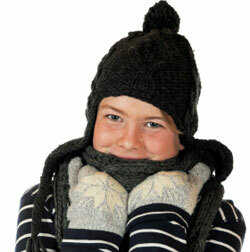 Choose mittens or gloves with a waterproof covering, especially if you are going to be playing outdoors. Keep your feet warm. Start with wool socks; again, avoid cotton. Then choose boots that are waterproof and insulated with something to keep your toes toasty. Consider hand- and foot-warmers. If you are going to be outdoors for a long time, consider picking up some inexpensive hand-warmers and foot-warmers that you can slide inside your boots, mittens and pockets. They usually produce heat for several hours, and they can be just the thing if you are ice-fishing, skating, skiing or just walking around outdoors in the cold. Don’t forget sunglasses and sunscreen. Sun reflecting off snow or ice can be brutal; just ask any skier who has taken off goggles at the end of the day to reveal a serious case of raccoon eyes. So don’t forget to wear sunglasses to protect your eyes and sunscreen to avoid sunburn.